This is an integral class to our philosophy of cultivating the best in our children and raising well rounded individuals whom will be better suited for life's challenges. 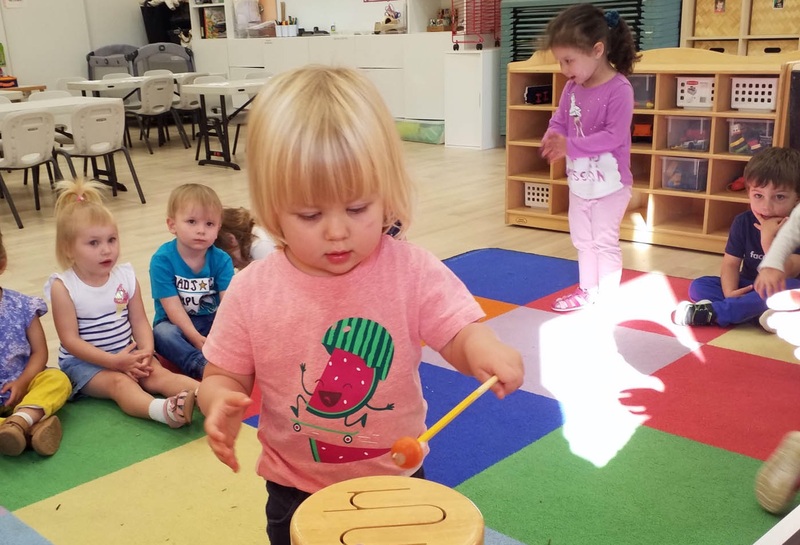 Preschoolers are at an ideal age to expand their musical horizons and abilities. Experts have found that kids who grow up hearing music, singing songs, and moving to the beat are better equipped at creating more pathways or neural connections between the cells in their brains. Research shows that kids who are actively encouraged in music do better in reading and math, are better able to focus and control their bodies, play better with others and have higher self-esteem. These are the reasons why we take pride in our musical program. Our music classes introduce children to Russian songs that they would never be able to get in a formal education otherwise here in the States, as well as classic children's melodies and songs in English. 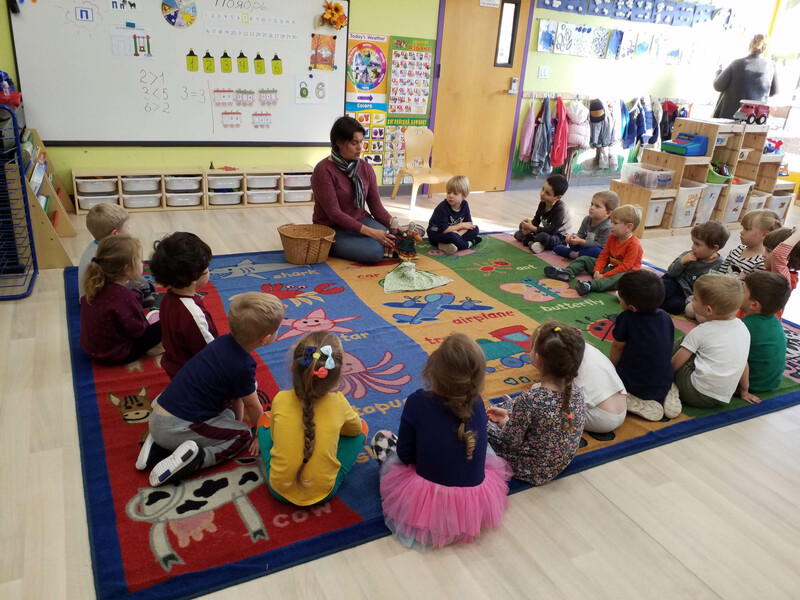 Throughout the course of the year, children are introduced to different musical instruments, listen to classical music and play beat and rhythm games geared towards developing a sense of melody and rhythm. We take pride in training our children to be great thinkers from an early age! Our young minds not only have fun in the classroom, but also develop critical reasoning skills and a genuine understanding of the logical processes required to solve math problems. 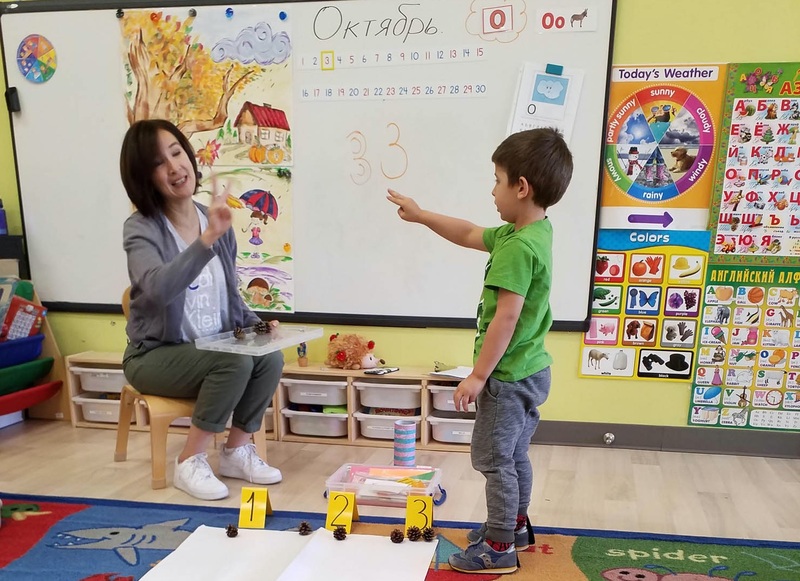 Along with the rigor and strength of the traditional Russian mathematical teachings, our math program helps students develop advanced problem-solving skills in an interactive environment full of fun games, stories and puzzles. The emphasis is on logical thinking, abstract reasoning, mental arithmetic and an understanding of mathematical tools. Our goal is to foster complex reasoning skills so that our students will have an advantage in their academic and professional careers: to learn to think as many of the brightest minds do – with the precision of a scientist or a doctor and the creativity of a novelist or a composer! Where we encourage our little explorers and further expand upon their excitement about the natural world! For young learners science is constant examination of their everyday world. We don’t have to teach young children how to wonder, discover, and explore through play because they do it naturally. Science has always been fun for children if presented in a language and method tailored to their needs and interests. We introduce amazing experiences that encourage discovery through playful exploration. 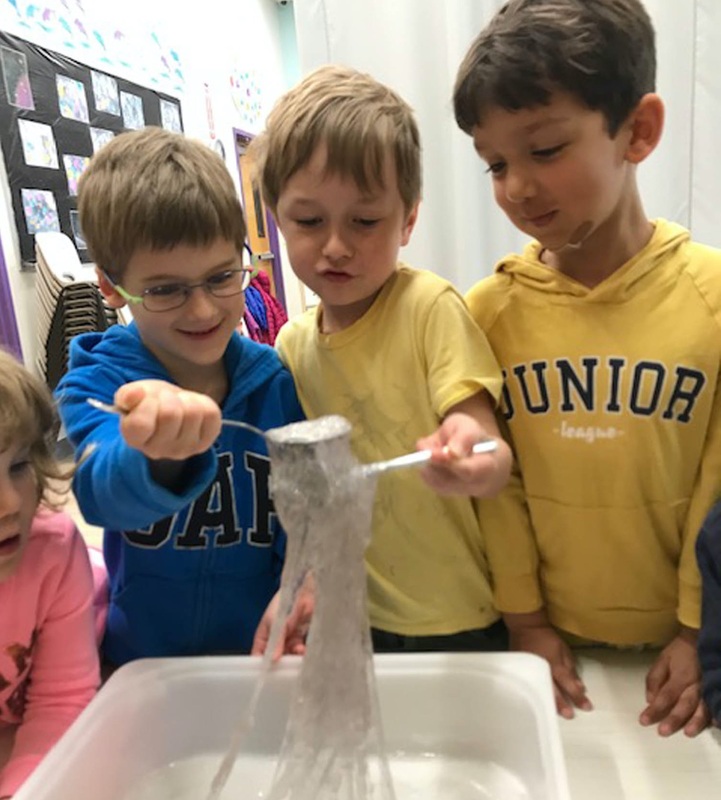 In science classes at Tiny Einstein, our teachers have the opportunity to create meaningful experiences that will have a lasting impact on our students throughout their entire school experience; fostering a desire to learn more about their natural worlds and expand on their desire to be the scientists they naturally are for the rest of their lives. If the science demonstration served its intended purpose, the students will come alive with a stream of questions. We encourage and explore their questions with full capabilities of the scientific method.That is what we encourage at our center - to help the young scientists turn their questions into an unforgettable learning experience that will last them their entire life. We encourage our children to get to know and expand all of their bodies abilities and capabilities right from the start! Early childhood is the crucial time to build the basic skills that are the foundation for more complex movement later in life. Children need to develop their body’s spatial awareness and practice their emerging motor skills. We assist children in developing an awareness of their bodies in relation to their own balance, strength and coordination. The psychological benefits of age appropriate exercise and games are just as important as the physical ones. Not to be overlooked are the positive effects of physical activity on self-image and self-confidence, and on promoting general feelings of health and wellness. An active student can sit still or stay focused on academics for much longer than an inactive student. Our fun filled PE classes are a big hit with our students and create confident capable movers and shakers! We bring your children to a fascinating world rich in Russian culture and legacy, that comes alive before their very own eyes! Tales are an integral part of our Russian culture, tradition and customs and our curriculum would be incomplete without it. 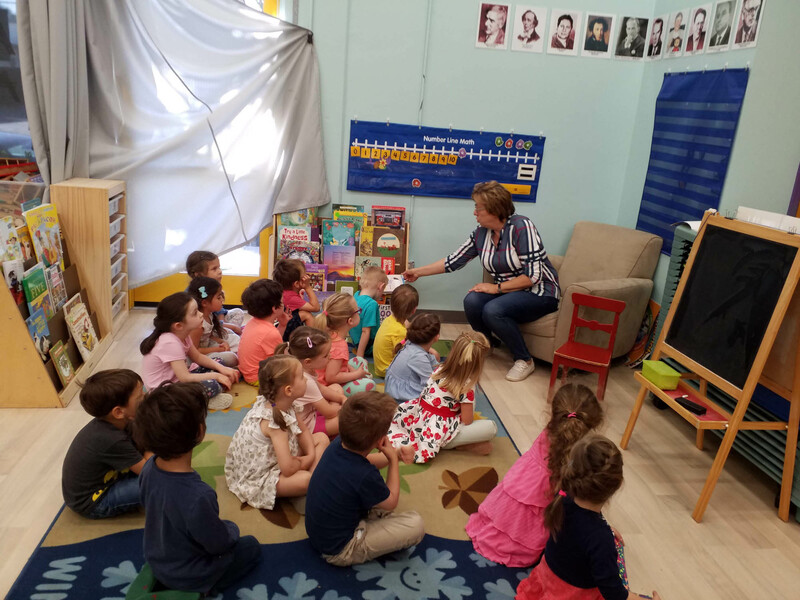 We at Tiny Einstein believe that these activities are crucial to early literacy development, not to mention an irreplaceable cultural experience. Articulation is the ability to make sounds clearly. By the age of four a child should be 100% intelligible even if they continue to have some articulation errors. Unclear speech can impact significantly how well a child can interact with adults and peers and can affect the development of thier language and social skills. A child who is having difficulties being understood can become frustrated and angry which may lead to behavioral issues. Articulation is also important in literacy skills such as reading and spelling out words. In order to be able to express basic needs and wants, right through to being able to engage in complex conversations, clear speech and pronunciation is critical. Our speech enhancement classes are conducted in a relaxed, fun filled atmosphere with age appropriate material. Our task is to improve Russian and English pronunciation in our students, leading to improved self confidence, independence, better social skills and provide a good grounding for reading and spelling. We want to introduce our children to the beauty that is the Russian language, the complexity and subtlety of our lexicon. Through our interactive lessons, we wish to enhance our students early language development, increase their Russian vocabulary and improve their conversation reading and writing skills in the Russian language. Children learn the Russian alphabet, and are introduced to the basic concepts of reading and writing in Russian. They read traditional and modern Russian stories, poems and songs. Our experienced and talented teachers nurture children's creativity and interest in Russian Language by finding great reading materials appropriate for the children's age and skills, introducing them to the early stages of reading comprehension and allowing them to progress in their writing skills. Your children leave our school here at Tiny Einstein with a natural enjoyment of education and the gift of the highest quality of education centered around their well being. We continually further their own inherent abilities to be the best little explorers and strong minds that they can be! We take pride in preparing our children for whatever education lies ahead of them after their amazing program here at Tiny Einstein. We are confident that they will succeed in their continued education and be ready to enter the most prestigious of educational endeavors after leaving our program. We continually further their own inherent abilities to be the best little explorers and strong minds that they can be! Our special Pre-K program focuses on ensuring that every child meets our highest academic standards. We make sure that students graduating from our nurturing program have advanced reading and writing acquisition, fluency in dual languages, artistic and creative influences, adequate social and emotional skills,, behavior regulation, and independent self-help skills. 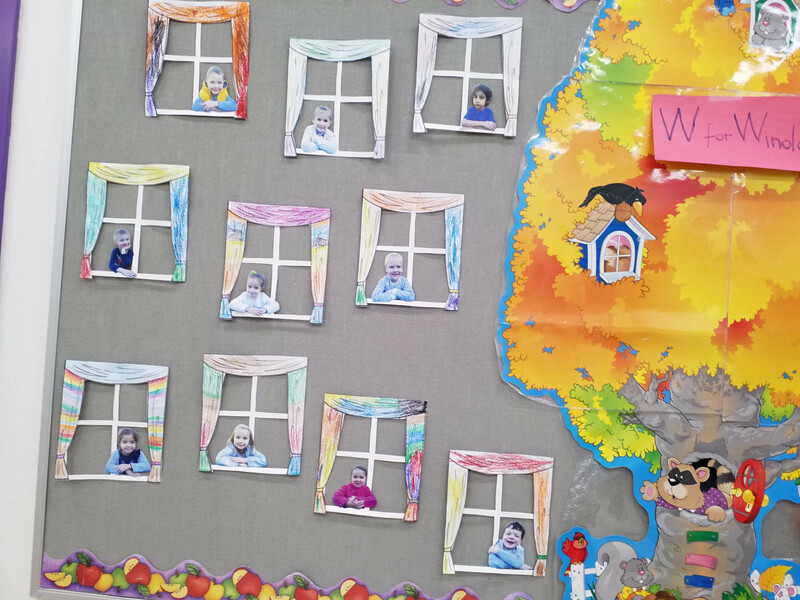 At the same time they gain the accountability that is required to walk into a Kindergarten classroom confidently while proudly being enthusiastic about learning. This enthusiasm for a life long passion for education we carefully instill in their young minds and tender hearts . We achieve this through our program, which is centered around furthering our children’s joy of learning and enabling the enthusiasm our children have to learn new skills, while at the same time allowing them to have confidence in their abilities when acquiring new abilities and working through new challenges. We take example from our namesake once again and enable the children's joy and natural curiosity as best we can while preparing them for the highest in academic standards.